Human Pepsinogen I ELISA Kit — Epitope Diagnostics, Inc. This ELISA (enzyme-linked immunosorbent assay) kit is intended for the quantitative measurement of human pepsinogen I levels in serum. Pepsinogen I levels are a useful tool in the determination the functional states of acid-secreting gastric mucosa. 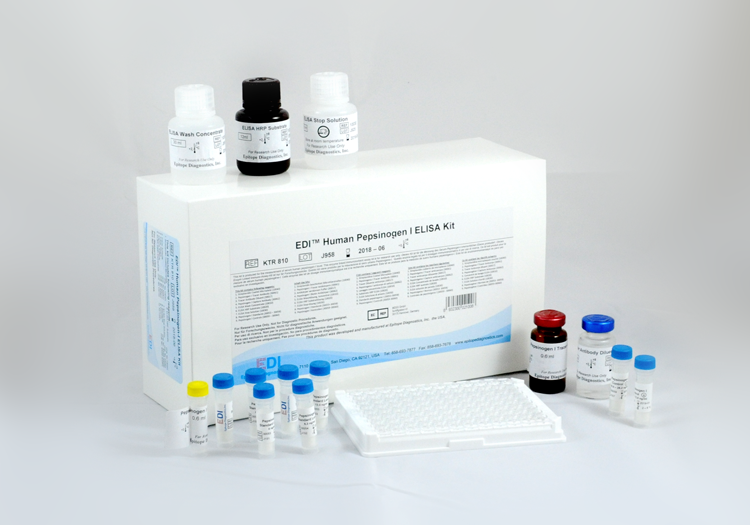 This pepsinogen I ELISA kit is for in-vitro diagnostic use. Pepsinogen consists of a single polypeptide chain of 375 amino acid residues with an average molecular weight of 42 kDa. Pepsinogen I is synthesized at gastric cheif cells and mucous neck cells, while pepsinogen II is also produced by clear mucous cells of antrum, etc. The clinical applications of measuring pepsinogen I and II are a useful aid in the diagnosis of severe atrophic gastritis and stomach cancer. It has been suggested that the measurement of serum pepsinogens serve as a "serological biopsy" for predicting the presence of atrophic gastritis or superficial gastritis. Atrophic Gastritis: It has been found the serum pepsinogen I levels falling lower than 20 ng/ml was highly specific for severe atrophic gastritis. It was also observed that serum pepsinogen I levels fell with increasing severity of mucosal damage in such cases. The diagnostic sensitivity and specificity of serum pepsinogen I levels for advanced atrophic corpus gastritis are about 92% and 90% respectively. On the other hand, the decrease in serum pepsinogen I levels in patients with pernicious anemia and atrophic gastritis was found to be associated with normal or raised pepsinogen II levels. Therefore, a pepsinogen I/pepsinogen II ratio is significantly lower than those with superficial gastritis or normal remnant mucosa. Stomach Cancer: Low serum pepsinogen I levels were found in patients with gastric cancer, with a threefold higher incidence. Other studies have concluded that low serum pepsinogen I levels may identify persons at increased risk for intestinal types of stomach cancer. Duodenal Ulcers: A low serum pepsinogen I level can exclude a diagnosis of duodenal ulcer. Although a high pepsinogen I level has less clinical use for establishing this diagnosis, the combination of hypergastinemia and a highly evelated serum pepsinogen I level strongly suggests the possibility of Zollinger-Ellison syndrome.